Hardison was a flamboyant singer and pianist who recorded the original version of "Too Much" two years before Elvis took it to the top of the charts in 1957. 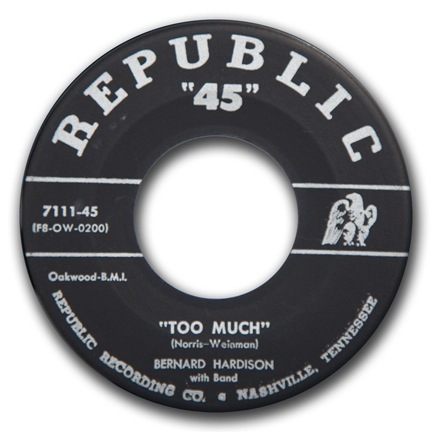 The recording was made by Tennessee/Republic co-founder Bill Beasley and released on Republic 7111.The Louise Brook's Band provided the backing for Hardinson. It seems that Beasley and his wife, Joan Norris, wrote the number, but publishing deals and lawsuits led to the credits going to the song's publishers, Lee Rosenberg and Bernard Weinman. Lee Rosenberg was a former secretary of Bill Beasley's; her share of the songwriting credits were passed to Elvis.